General Information: Description/Taste - Cherums are about the size of a small plum, approximately 1.25 inches in diameter. It has a purplish-red exterior skin with peaking yellow undertones. The inner flesh is yellow-amber with a pink ring underneath the skin and a very small seed. The Cherum is very juicy and sweet with rich plum-like flavors. Seasons/Availability - Cherums are available for a short time in the summer. 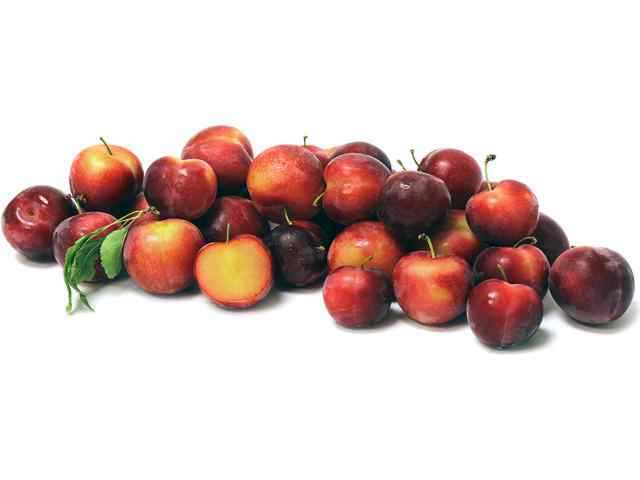 Current Facts - The Cherum is a hybrid stone fruit of the cherry and the plum. It was developed at Zaiger's Genetics of Modesto, CA, who are also the inventors of pluots and apriums. Cherums predominantly exhibit the genes and characteristics of cherries, whereas plerries are a predominantly plum cross. Nutritional: The various blends between cherries and plums lend to a sweet fruit that is high in calcium, iron, potassium, vitamin A, vitamin C and dietary fiber. No cholesterol. Applications: Applications - While there are over 50 different hybrids of cherums, many have been found to have excellent quality for canning, jams, jellies, pies and juices. Some have dessert quality. History: Ironically, the intent of crossing cherries with plums was not to develop a new fruit – it was rather to make the cherry more grower friendly. In Modesto, California they wanted to develop a cherry that would be less prone to cracking, have a higher sweet/sugar content and have a later-in-the-summer maturity date like plums. These trees grow well in a sandy soil.